Today's 365 Days of Astronomy Podcast Offers a Free, Online Astronomy Class! The marvelous 365 Days of Astronomy Podcast has begun its fourth year of daily offerings from contributors around the world. The Planetary Society will originate at least 12 podcasts in 2012, each on the last Thursday of the month (except for August, when we'll be heard on the fourth Thursday). Our first effort of the year is featured today! I talk with our own Bruce Betts about his soon to begin online astronomy course originating from California State University, Dominguez Hills. High school students in California may be able to take it for college credit. The rest of us can enjoy each lecture for free! You can learn more from the CSUDH Young Scholars page. Click the link there (or here) that, as I write this, still says Fall 2011 Schedule. It will take you to the Spring 2012 lineup, which includes a description of PHY195 Astronomy, The first lecture is Wednesday, February 8. Bruce would love to have you join in! MAT: Hi, folks. I'm Mat Kaplan of the Planetary Society with today's podcast contribution. I produce and host Planetary Radio for the Society. It's our public radio and podcast series that chronicles humankind's progress toward its destiny in the solar system and beyond. We do this by presenting the scientists, engineers, space travelers and writers who are leading the quest. We also talk each week with Planetary Society blogger and space imaging manipulator extraordinaire Emily Lakdawalla. Bill Nye the Science and Planetary Guy shares his observations. Bill is CEO of the Planetary Society. And we close each episode with our What's Up segment. My colleague Bruce Betts joins me for a look at the current night sky, a look back at this week in space history, and a random space fact. We also offer a weekly space trivia contest. Bruce is the Society's Director of Projects, but he's much more than that. Dr. Betts is an astronomer and planetary scientist who earned his PhD at CalTech. I recently sat down for a quick conversation with Bruce about something he'll be doing again very soon that will allow him to share his love of all things astronomical. Mat: And that's the fact that you're going to be back in the virtual classroom. Bruce: I am. I'm going back in the virtual classroom after several years absence, teaching Introduction to Astronomy and the Solar System at California State University, Dominguez Hills. Mat: Thank you for getting it right for my former employer's sake, up the road there in Long Beach. And we wouldn't be talking about this--I mean we'd mention it because it's pretty cool--but what's really cool is that our listeners and others, anybody can participate. Bruce: You can, indeed. It is going to be going out live over the Internet, and also the classes will be archived on the Internet. So you can participate live, but, yeah, it'll be open to anyone out there, not for credit to anyone, but in terms of if you want to tune in. And you tune into the live showings, which will be on Wednesdays from 3:00pm to 4:30pm Pacific Time, between February 8th -- that's the first class -- and May 9th -- that's the last class. You can even call in with questions. They've got an 800 number, or you can connect via the Internet, via their website. You can submit electronic questions. It will pop up on my screen in front of me. I can get confused by them, and misread them. Mat: I have to practice my heckler voice. Wait, I'll do that when we're offline, cause I'm definitely going to tune in. Now, now, regular folks like me, we can't take it for credit, but you're doing this for some young people, right? Bruce: I am! People at the university can take it, but also this is part of a special program there called Young Scholars, and it offers college courses to California -- you have to be in California, unfortunately -- but, California high school juniors and seniors are eligible to take this class remotely and do it for credit. And they actually show it in Southern California, they show it on many of the cable -- cable companies carry the class as well as it's going out over the Internet. Mat: I remember watching a little bit of this the last time you did it. It's a lot of fun! It's a really great---I mean, how would you describe the course? It's a general survey? Bruce: It's a general survey course. It's really -- because of my background -- not surprisingly I will focus on the solar system. So most of the lectures will cover our solar system. We'll take a tour, we'll visit each of the planetary systems, out into the Kuiper Belt and the Trans-Neptunian Objects, but we'll also start the course after doing a tour we'll talk about, a little bit about telescopes, how they work, talk as I do here about easy things to look for in the night sky. We'll also go a little bit into broader things: stars and how they work and galaxies and big bang and all that good stuff. It's an introduction to astronomy with a heavy emphasis on the introduction of planetary science and the solar system. It's appropriate for certainly high school, undergraduate college people who just have general interest. Bruce: That would be great! Thank you, thank you! Talk about things we truly don't understand because I get perplexed about those. Mat: I'll bring Stephen Hawking. Bruce: No, but you can come on and talk in the show! Mat: It would be fun to do that, wouldn't it? Bruce: Maybe we can record a Planetary Radio episode. Mat: That would be fun! Do it right there! Throw a trivia question out. Bruce: Got an hour and a half to fill in these lectures. Bruce: I probably will steal some...not probably, I WILL steal some of your Planetary Radio guests and use them for portions of the lectures. I'm going to try to call in experts over the Skype line, as you like to say. Bruce: So it will be broad. We'll also have course materials available online. It will be good! And by the way, if you are just watching for fun, you don't actually have to take the tests or do the homework. Although I found, interestingly, when I did this before, people actually wanted them online. So we posted those on the Planetary Society website. Bruce: Ha-ha! So we'll try to do that this time, as well. We'll have it on the Plantary Society site, and they'll be mentioned on the site. Should I mention some websites where people can find these? Bruce: And then also we'll put real links on the Planetary Radio page. The basic sites for the course are dhtv.csudh.edu. That's Dominguez Hills TV. And it will be on there under distance learning. Or you can search for Young Scholars Programs or go to youngscholars.tv. I know they're still filling out the sites so you may not have all the information. February 8th, 3pm, is the first class. 3pm Pacific. Mat: Very cool! I will be there. Thank you. 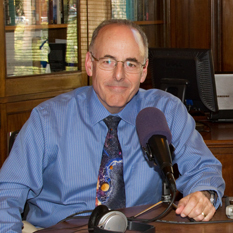 Mat: My guest has been my friend and colleague, Dr. Bruce Betts, planetary scientist and Director of Projects for the Planetary Society. I hope you'll join me in his free, online Astronomy course beginning February 8. I'm Mat Kaplan, and I'll be back with another 365 Days of Astronomy podcast on February 23rd. In the meantime, you'll hear from me on Planetary Radio at planetary.org/radio. Clear skies.